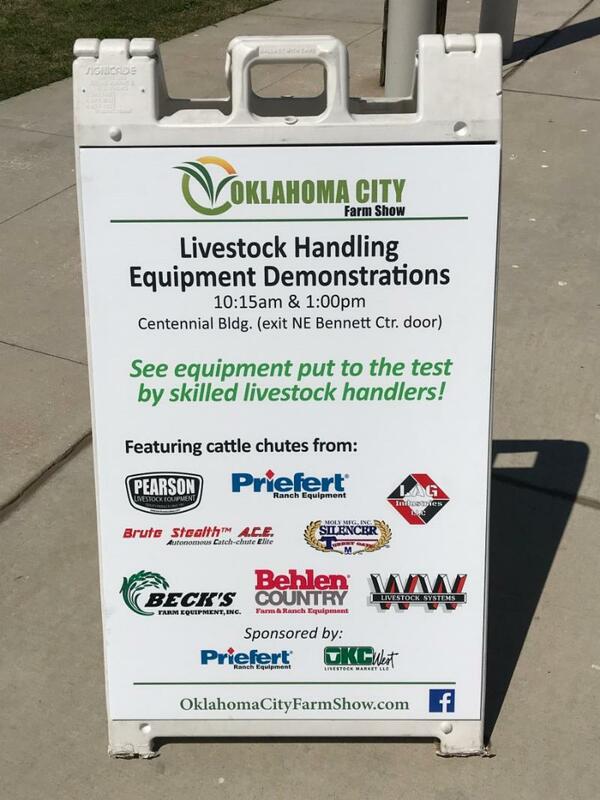 It's day two for the 2019 Oklahoma City Farm Show- Thursday saw excellent traffic in the aisles inside the Bennett Event Center at State Fair Park- between the exhibitors inside and those outside- about 350 exhibits are in place and are showing off everything from zero turn mowers to large four wheel drive tractors to drones to very very bright LED shop lights. Our friends at P&K Equipment have packed a lot of equipment into their space- they have prices actually attached to their machines and I think those prices ranged from $6,000 for a zero turn mower to almost $200,000 for the largest tractor in their display. One of our sponsors that I did not list yesterday in our story on the Farm Show has a booth and is talking with folks about what they have available here in 2019- Herb's Herbs has got a great brochure that explains how they can help you stick your toe into the industrial hemp production business- they are not far from the main entrance of the Event Center in booth 2063. The Radio Oklahoma Ag Network booth is 805 along the eastern wall of the Event Center- come by and say howdy! Thus far in 2019, Governor Kevin Stitt has signed 19 bills sent to him by the Oklahoma Legislature- including ten yesterday. One of those is House Bill 2373, a bill promoted by the Oklahoma Pork Council and the ag community that will cap non economic damages in nuisance lawsuits. Click here for the bill's language and click or tap here for our earlier story that featured comments by Roy Lee Lindsey of the Oklahoma Pork Council on this measure(and more). A delegation of more than 60 Oklahoma Farm Bureau members are in Washington, DC this week to speak with our state's Congressional leaders and other policymakers about the pressing issues impacting Oklahoma's agriculture industry and rural communities. We had the chance yesterday to speak with OKFB President Rodd Moesel from our nation's capital, for a brief update on the work that has been done there on behalf of Oklahoma's farmers and ranchers by the delegation. According to Moesel, the delegation was able to get some quality face to face time with all but one of Oklahoma's Congressional leaders and remarked on how impressed he was by their attention and concern for our farm and ranch community. In addition, the delegation has also met with foreign leaders at the Canadian Embassy and have interacted with the delegations of other state Farm Bureaus at multiple briefing sessions hosted by the American Farm Bureau Federation. Moesel reports that among the many topics discussed, one obvious issue rose to the top, that of course being the matter of trade and its impact on Oklahoma and our nation's farmers. Moesel insists these meetings with legislators are vitally important to OKFB's cause and helps maintain the association's relationship with our lawmakers and keeps OKFB's message and viewpoints front of mind. Hear Moesel's full briefing on the delegation's activities this week in DC, by clicking or tapping here. Our own Carson Horn caught up Michael Kelsey, executive vice president of the Oklahoma Cattlemen's Association this week. Kelsey and several OCA members are in Washington, DC this week, for the annual beef industry fly-in during which producers across the nation come to speak with policymakers about the most pressing issues pertaining to their industry. Aside from our own Congressional leaders, Kelsey says they have also had the chance to meet with legislators from other - less ag literate states as well about trending industry topics, including Democratic Congressman Thomas Suozzi of New York. Kelsey says they had a very constructive meeting educating him on the challenges facing the beef industry. Trade was widely discussed in each of their meetings this week, as were other issues like the revision of the Waters of the US rule, the Hours of Service rule and the implementation of the new Farm Bill. In addition to covering their trip, Kelsey also offered a brief update on the Oklahoma Legislative Session. Over the last several days, Kelsey says movement has been made on several of the bills they have been watching. For instance, the legislation exempting water rights from land seized through eminent domain was passed off the Senate Judiciary Committee since our last conversation with Kelsey. That bill will be considered on the Senate Floor next week. This week, the bill restricting cell-based meat from being labelled as beef came off the House Ag Committee and now awaits consideration in the full House. Also, a bill exempting certain livestock haulers from required registration with the Dept. of Transportation is still being worked on while the State Steak bill, which would designate the ribeye as Oklahoma's official steak, went off the House Tourism Committee and is headed for the House Floor this coming week as well. For more details on their trip to DC, the discussions they've had there and what's been happening at the State Capitol the past few weeks, click here and listen to Kelsey's full conversation with Carson. Wheat prices this week are near a five year low with the May contract at $4.40 - just a $0.06 spread from the July contract at $4.46. According to OSU Extension Grain Market Economist Dr. Kim Anderson, while the futures market is down, the basis is relatively high. However, it is a wash when you consider how low the cash price for wheat is. This concerning outlook is reflected in planted acres here in Oklahoma, with total wheat acreage down. However, the crop's condition compared to the last two years is significantly better at 69 percent good to excellent and just 4 percent poor to very poor condition. You can watch their visit tomorrow or Sunday on SUNUP- but you can hear Kim's comments right now and see what else is on the lineup for this week's episode, by clicking here. Colin Woodall, senior vice president of governmental affairs for the NCBA, is apparently pretty impressed with the effort in which the Trump Administration is investing in its attempt to close the several ongoing trade deals that between the US and multiple other countries that still remain in negotiations. The main focus, of course, is on China right now. Given the level of discussion currently, with the USTR's office and Chinese delegates down to negotiating the finer points of a deal, Woodall says things look fairly promising that a pact will at some point hopefully in the near future be made. "The Administration is hustling and they're doing a good job. Of course, top of mind right now is China and we are very optimistic on where those discussions are going," Woodall said. "Specifically for us in the cattle business, we continue to push for alleviation of the ban that they have on beta-agonists and the use of implant hormones." Woodall says while Chief Agricultural Negotiator, Ambassador Gregg Doud, continues to push for that, overall the talks seem to be progressing pretty well. However, Woodall reminds us that this is China we're dealing with and we're all too aware of China's notorious habit of stringing things along and suddenly cutting ties when it seems like things are headed in the right direction. All that to say, at this point really anything is possible. In the meantime, though, the nation continues to wait on Congress to ratify the USCMA deal, though the Democrat led House is in no rush to help President Trump deliver on a campaign promise. Listen to Woodall discuss the progress of these trade negotiations on yesterday's Beef Buzz - click here. We continue our coverage of the 2019 Oklahoma FFA Star Finalists with this year's Central Area Star in Agriculture Placement, Seth McCaa of the Elmore City - Pernell FFA Chapter. Seth is recognized for his work while employed at Coppin Ranch Hand Services, working for farmers and ranchers in his area. Seth is also employed by Diamond R Ranch, a multimillion-dollar race horse operation located in Pauls Valley. At his jobs, Seth works daily with livestock and especially horses. You can hear our entire conversation and learn more about Seth's experience in Ag Placement, by clicking over to our Blue-Green Gazette which features the stories of other Star Finalists we've spotlighted this week. Be sure to check in each day for the next few weeks as we continue to highlight these young achievers leading up to the 2019 Oklahoma FFA State Convention April 30 - May 1. To get the full details of the report click or tap here.